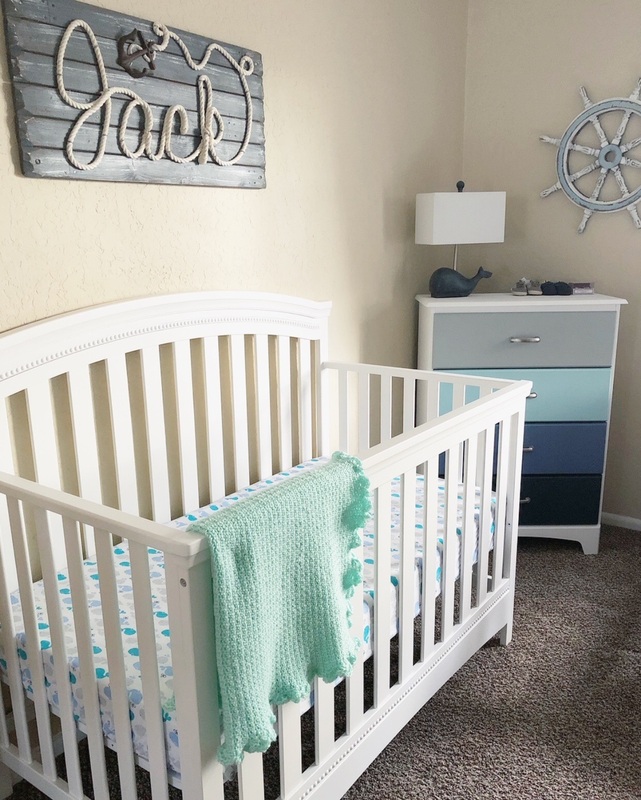 One of my favorite parts of pregnancy has been designing Jack's nursery. 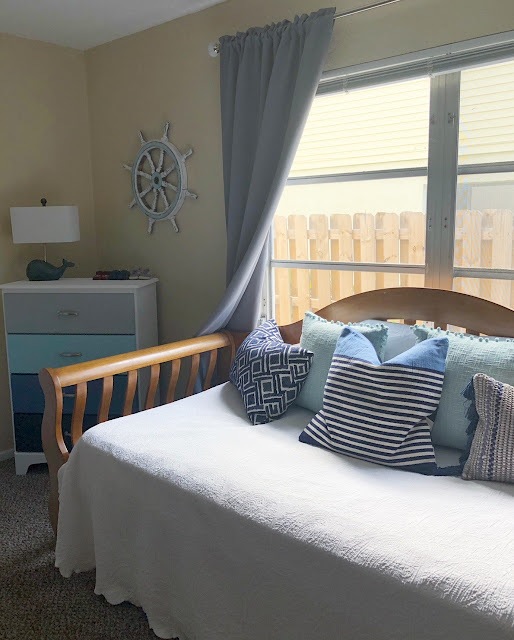 We decided to go with a nautical theme, which feels like a natural extension of the decor in our beach bungalow currently. I had so much fun curating all of the pieces - a sign with his name, wall decor, and pillows - all in shades of navy, blue, white, grey and touches of seafoam. The end result turned out exactly how I had envisioned! It's hands-down my favorite room in our home and I've been spending a lot of time in there just daydreaming about our little guy. 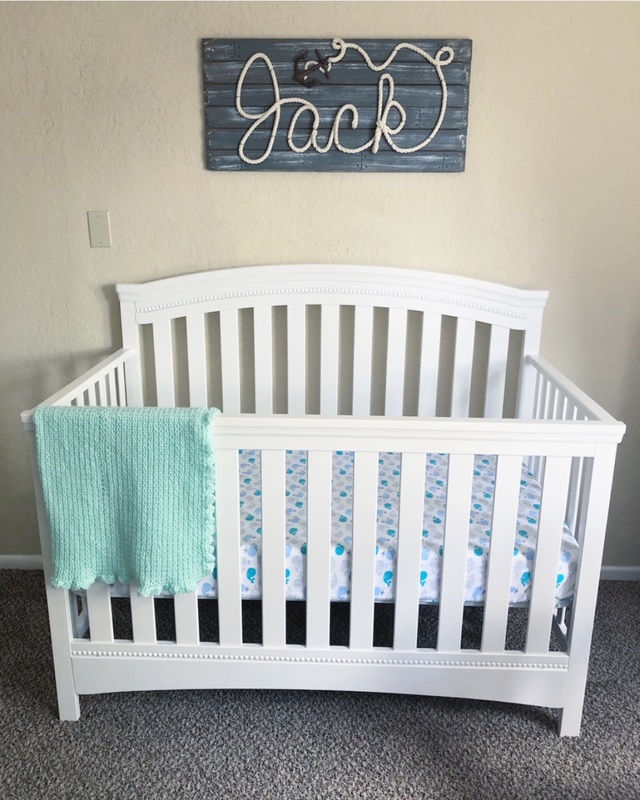 The Jack sign was the first thing I bought for the room - it's custom from Etsy and I love the rope and anchor design. My Aunt and Uncle gifted us the crib for our baby shower, and surprised us with a beautiful baby blanket that my Aunt Patty hand-crocheted! When my parents moved out of their house earlier this year, we were fortunate enough to inherit a lot of furniture - including a day bed and dresser that Greg re-painted for the nursery. We picked out 5 paint swatches to coordinate the dresser drawers with the rest of the room. The throw pillows are all from Home Goods and Pier 1, and the grey blackout curtains are from Amazon. 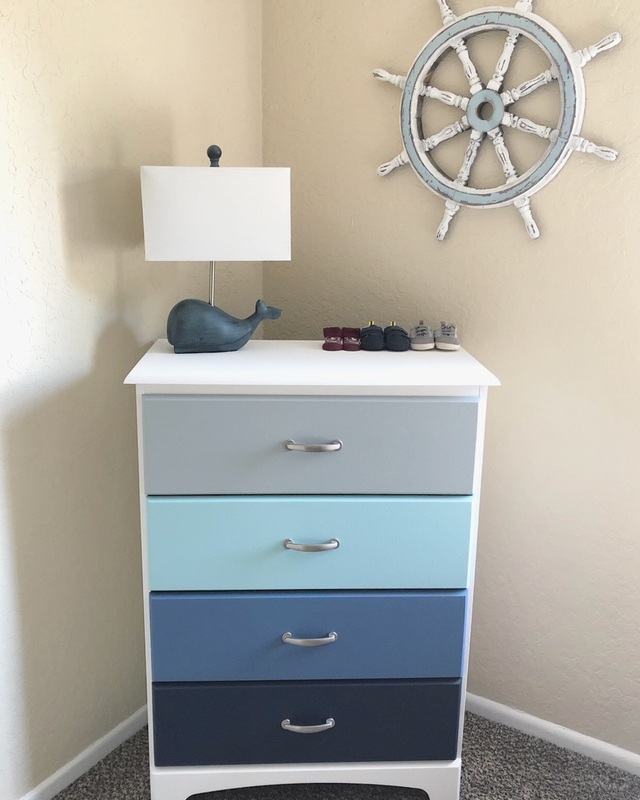 I absolutely love the way the dresser turned out - Greg did an amazing job flipping the former black dresser into a colorful piece that really ties the whole room together. The whale lamp is a Home Goods score, and we found the ship wheel on Amazon, which matched the dresser perfectly! 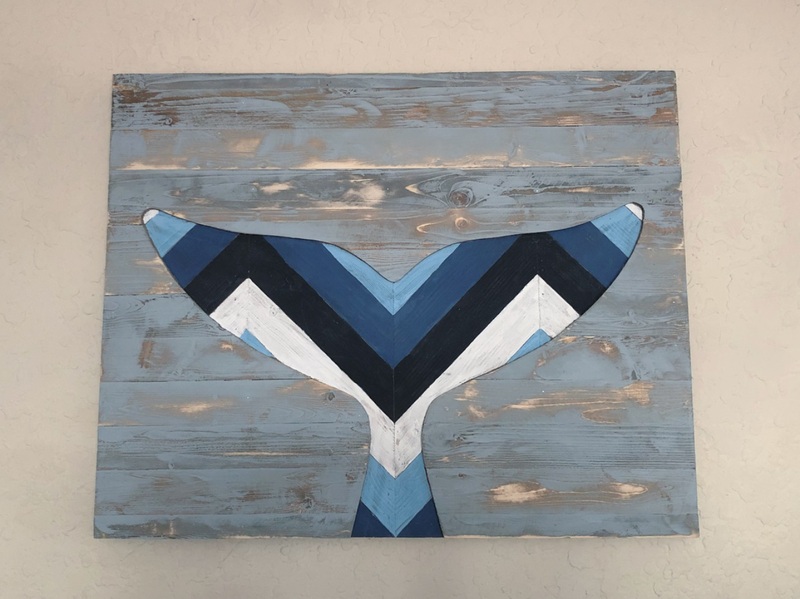 Greg also re-did the whale tail wall art that we found at T.J. Maxx, by painting the background the same grey as the top drawer of the dresser and then sanded it down for a distressed look. 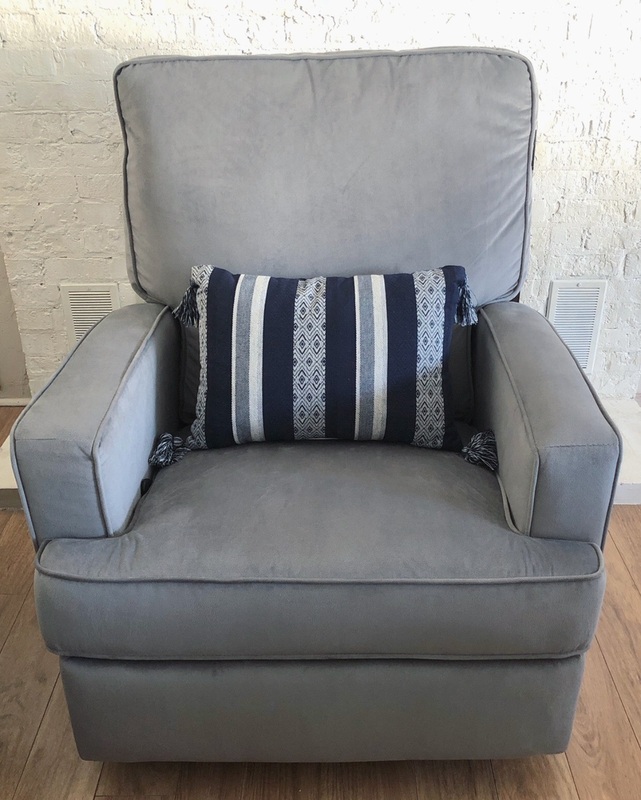 We bought the reclining rocking chair and throw pillow from Target, which is so comfortable! Can't wait to rock Jack to sleep every night. A little over 2 months to go!